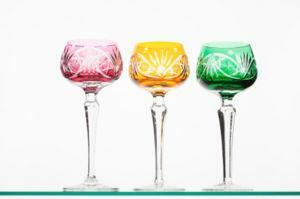 When you use etching gel for glass, even the most inexpensive piece will seem elegant and look like it cost a fortune. Custom glass etching does not require a lot of specialty equipment and can be used for personalized wine glasses, mirrors or awards. Follow these few simple instructions to understand how easy this technique is, and you will soon be on your way to creating your own customized gifts and housewares. There are several manufacturers of etching gel. Though most are very similar, a few have special features worth considering since using etching gel for glass is easier if you are working on an intricate design. Etchall Dip N Etch is intended for use on odd shaped items that do not have a flat surface. For this type of etching gel, you merely dip the object into the liquid. The unused liquid can also be re-used, which makes this type an economical option if you have many items to etch. Etchall Resist Gel is used when you want a negative design on your piece. Apply the gel over the areas you want to stay clear then the piece is dipped into the Dip N Etch liquid. After drying, the gel is removed leaving a reverse or negative image. Armour Products also offers glass-etching chemicals for use in a variety of applications. For newcomers to glass etching, it may be helpful to purchase one of Armour's complete etching kits. They come with everything you will need to make several pieces. In addition to your etching chemicals, you will need to gather the following items before getting started on your etching project. Wash the glass piece with window cleaner and let dry. This is to ensure the etching chemicals adhere properly when applied. If you plan to use a stencil, apply it now. Since etching gel is used as a mask similar to etching stencils, it is not necessary to use a stencil unless the design is extremely intricate. Apply the desired etching stencil sticky side down. Starting in the center of the stencil, press firmly and rub towards the edges to remove any bubbles. Pull the cover off the stencil so that only the design is left on the glass. While wearing gloves, apply the etching gel where you want the clear glass to later show through, taking care to let dry completely before moving on to the next step. Using the foam brush, paint the etching cream over the hardened etching gel and stencil. Use a thick coat to ensure the design is totally covered. Wait approximately 15 minutes, then remove the etching cream with paper towels. Since the chemical can burn exposed skin, make sure you wear gloves at all times. Using a bucket of soapy water, thoroughly clean all of the etching cream residue from your piece. Peel off the hardened etching gel and stencil if one was used. The result should be a clear design surrounded by etching. If you are not a natural born artist, consider checking out these online suppliers of design stencils. Hundreds of designs are available and some suppliers will even create a custom stencil just for you. Whatever project you decide to tackle, know that you are creating a custom gift or personal item that shows you have put the thought behind it. When you take time to make it personal, the recipient (or you!) appreciates it even more.